This chart comes to us via a brief post by Elise Gould of the Educational Policy Institute (EPI), a labor-oriented Washington, D.C. think tank. In this chart we get some corollary information to augment our understandings of the economic benefits of a degree, usually stated in terms of mean wages. We know by now that those with a degree typically make more than those without, and that certain degrees pay more than others. Here we get some idea of the impact a degree, or lack thereof, can have in a declining wage market. We often read that the overall net value of a degree in the marketplace continues to decline. 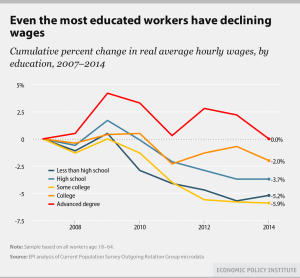 After all, wages for graduates continue to decline even as tuition costs rise. This chart evidences the first of those points. What we observe here, however, is that costs aside, the stability of degree holders’ incomes in relative terms when compared to the alternatives. The main benefit of a college degree may not be entrance into a great jobs environment, but into a less-bad one. The sharpest declines in wage growth were experienced, inexplicably, by those with some college but no degree. While those with some college education under their belt continue to make more than those with no college attendance we yet again see one of the great dangers of only partial college completion. Students need to reason and respond accordingly. At risk of sounding like a broken record this set of data brings up two important points of application for the aspiring student. For one, we yet again see the need to keep costs at bay. If wages had kept up with tuition we could easily justify the added expenses of a modern education. But as this is not the case students need to be all the more cognizant to keep costs under control. With stagnant and declining wages of late we need to do everything in our power to reduce and contain college-related costs if we want our degrees to have the same level of benefit previous generations enjoyed. For two, we yet again see the need to map our way to a completed degree. It’s bad enough out there for those who have a sheepskin on the wall. Those who fail to obtain a degree in return for their educational efforts have the costs associated with higher education but very little of the benefit. The further one goes the worse this gets. Students need to map out their educational path, both in terms of semester-by-semester course requirements and income-to-expense budgeting. Better to discover a shortcoming on paper as a high school senior than to experience it up close and personal as a college sophomore. But what of the student who has dropped out or soon will? See this related tip wherein we explore how to convert that random collection of college credits into something more resumé worthy.